Wow – there’s been a lot of love for Dungeons and Dragons at Bookmans lately. People are picking up the Lost Mine of Phandelver starter set, dice, and game books in droves. There’s no better time to impart some wisdom for newbies from a veteran player! 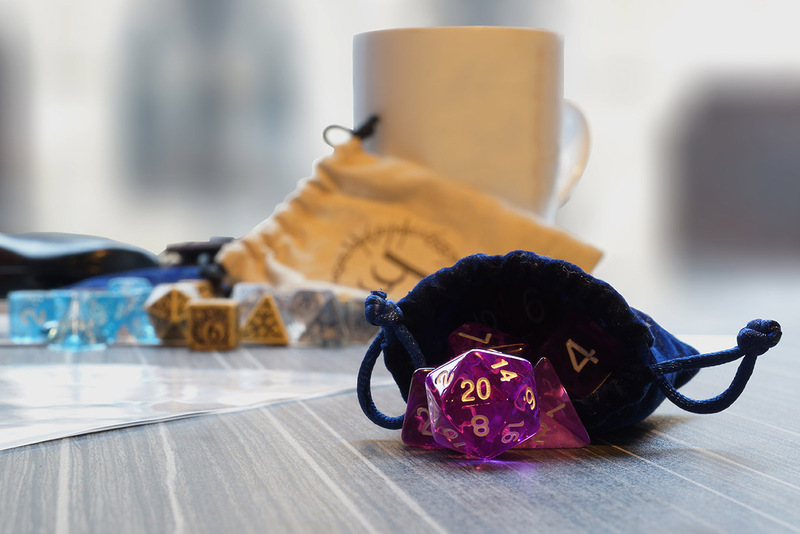 Hopefully, these will help you navigate the world of D&D and bring a new level of adventure to your game nights! Always have an easy-to-reach, updated character sheet on hand. I recommend on your phone, Google Drive doc, or in your email. If you play in-person, there’s a chance you may misplace or forget your sheet. If you play online your program may crash. You may even go out of town or have a random game night on a typical off night. Having an updated copy of your sheet close at hand will save your dice bag one day – I promise. Arguably one of the most recognizable aspects of Dungeons and Dragons that isn’t obvious to new players. Perhaps you have heard the terrified gasps after a player mentions, they rolled a “Nat 1.” Or someone talks about rolling a “Nat 20” and saving everyone’s rear. All actions in Dungeons and Dragons succeed or fail based on a number, whether opening a door or convincing a king, not to wage war. When a character attempts an action a D20 is cast- the number that it lands on is the “Natural” (or “nat”) number. Characters have abilities that either aid or hinder their success by adding or subtracting from the natural number. Criticals, however, are either an automatic and brutal failure (nat 1) or a blindingly cool success (nat 20). Some abilities can change this fate such as Luck or Advantage. Typically, criticals lead to the most memorable moments in a campaign. Keep in mind the difficulty check, known as the DC, on rolls. This is especially important for the Dungeon Master. The DC is the number that needs to be met or exceeded to succeed whatever is being attempted. Easy actions, opening an unlocked door, for instance, have a low number usually 0-10. Medium actions a medium number 10-15, and hard actions a high number 15-20. When planning your challenges, keep those in mind. Speaking of success and failure, don’t be afraid to lean into any negative characteristics your character may possess. Whether it’s from a poor attribute (low Dexterity, Strength, for example) or because you just wanted a character that is a kleptomaniac, flaws are what create depth. They are also often what a player loves most about playing. My own character, Althea, is an optimistic Druid with horrible Charisma. She is stubborn and tries to take every problem on herself. She can’t communicate with others well, so she just doesn’t. Aside from being a fun personality to play, she often reminds me as a person that it’s okay to rely on others a little bit too. You may find playing as a dimwitted character that you often have brilliant and creative ideas. Maybe playing an irritable character can release some stress for you. Don’t discount the flaws that make your character infinitely more interesting. Metagaming is when your characters’ actions are directly influenced by the players deeper knowledge of the game. Basically, it’s your character acting as though they have knowledge that only the player does. For instance, two characters are having a private conversation away from the party but the conversation is said at the group table. In the private conversation, a HUGE secret is divulged. For instance, it is said that Sari is a werewolf. When characters that were NOT able to hear or be part of that conversation act on that secret knowledge, ie suddenly buy ALL the silver or won’t go walking with Sari at night anymore, then it’s Metagaming. And it’s bad. It just derails the game. Metagaming can be sneaky so try hard to have your character react to only what they know. Don’t be afraid to make mistakes or stumble while playing as a character. It is challenging sometimes to think of how a different person would solve a problem. This is part of the fun. Don’t be afraid to embrace your character with gestures or trying a new accent. You’d be surprised how much fun it is to try sounding Texan or French for 2 hours. Your DM may even award you extra XP (experience points) or inspiration for trying. However, there are definitely Dungeons and Dragons games centered around numbers or survival if you prefer. As each person is playing a character, their character WILL react in ways the player wouldn’t. Teammates may not always be on the same page about how to solve a problem. This is why D&D is such a great tool for team building and group dynamics. Don’t be afraid to have a moment to check in either Out of Game (during gameplay) or after the Dungeons and Dragons session to check in with everyone. Don’t be afraid to ask what the player thinks about your characters actions or to verify everyone is still having fun. You might be surprised how much other players LOVE your character despite them wreaking havoc or disagreeing with the party. It’s surprising how attached a player can become to their character. People even grow attached to another’s character or an NPC (a non-player character which the DM creates and plays as). To combat the worry of losing an amazing character, try rolling a new one. Think about this new characters story, style, and personality. It’s not uncommon for a veteran player to have several characters they are excited to “bring out.” You can consider making this character a relative or friend to your other character. This way, should they fall, their memory lives on. Also, your character you can revitalize your character in a new campaign. It is smart to prepare for your character’s untimely demise. However, not many players are willing to let that happen without a fight. Therefore, potions. ALL the potions. When a character is new- the threat of dying is pretty common. They are, in gamer terms, “squishy.” While potions may be expensive and a pain at first, they are integral to gameplay. Buy, persuade, steal, or find health potions as much as you can. Many types of potions exist, but by far the most needed/used are health potions. Loving all this inside info about Dungeons and Dragons? There are still plenty more tips and tricks on the way, so stay tuned for additional blogs, adventurers! Want to learn more about D&D? We’ve got the 101 of D&D covered in this Bookmans blog!